Pro-Russian separatists in eastern Ukraine have seized a bus carrying international military observers, Ukraine's interior ministry says. 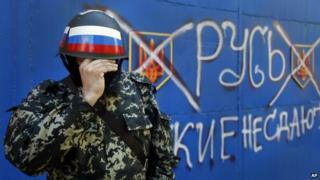 Negotiations were under way to secure the release of the observers, seized near the town of Sloviansk, it added. Western leaders earlier announced they were debating fresh sanctions against Russia over its alleged failure to help de-escalate the crisis in Ukraine. Russia has accused the West of wanting to "seize" Ukraine. Moscow has tens of thousands of troops stationed along its side of the border with Ukraine and pro-Russian separatists have been occupying key buildings in a dozen eastern towns, defying the central government in Kiev. A week ago, Ukraine and Russia struck an agreement in Geneva calling for the separatists to leave official premises and give up their arms. The pact included an amnesty for those agreeing to retreat peacefully. But so far the pro-Russian activists have refused to give in to the demands. On Friday, Ukraine's interior ministry said armed separatists had seized seven representatives from the Organisation for Security and Co-operation in Europe (OSCE), as well as five Ukrainian army personnel and a bus driver. The German foreign ministry confirmed 13 people had been detained. Pro-Russian leaders in Sloviansk confirmed that the bus had been stopped and said they were checking the identities of the people on board. The self-proclaimed mayor of Sloviansk, Vyacheslav Ponomaryov, said that at least one passenger had been carrying maps showing separatist checkpoints in the area, which suggested "their involvement in espionage". "People who come here as observers and bring with them a real spy - that's not appropriate," Mr Ponomaryov told reporters. The seized observers are not part of the main OSCE monitoring mission, which was agreed after long negotiations by Russia, Ukraine and the United States. Instead, they appear to be unarmed military observers from individual OSCE states. The German defence ministry, which is in charge of that mission, earlier confirmed that it had lost contact with the group. Also on Friday, the US, France, Germany, Britain and Italy accused Russia of violating the Geneva agreement and escalating the situation in Ukraine "through its increasingly concerning rhetoric and threatening military exercises on Ukraine's border". As a result, the leaders agreed to "work closely together, and through the G7 and European Union, to coordinate additional steps to impose costs on Russia", the White House said in a statement. German Chancellor Angela Merkel earlier said she had spoken to Russian President Vladimir Putin to express her dissatisfaction with Russia's lack of commitment to bring about a "peaceful path of discussion" with the separatists in eastern Ukraine. On Friday the Standard & Poor's agency cut Russia's credit rating by to one notch above "junk" status. The agency warned that further downgrades were possible if the West imposed tighter sanctions against Moscow. Ukraine warned it would consider any crossing into its territory by Russian troops as a "military invasion". The country has launched military raids to regain the buildings occupied by separatists in several eastern towns. Russian Foreign Minister Sergei Lavrov described the raids as a "bloody crime". On Friday, acting Ukrainian Defence Minister Mikhail Koval said Russian forces had come within a kilometre of the border. Ukrainian Prime Minister Arseniy Yatsenyuk accused Russia of wanting to "start World War Three" by occupying Ukraine "militarily and politically" and by creating a conflict that would spread to the rest of Europe. Raids by Ukrainian commandos around the town of Sloviansk left at least two separatists dead on Thursday. There have also been reports from the port city of Odessa indicating that an explosion at a checkpoint injured at least seven people. Unrest began in Ukraine last November over whether the country should look towards Moscow or the West. Last month, Russia annexed Ukraine's mainly ethnic-Russian Crimea. This followed a referendum in the region that backed joining the Russian Federation but which the West and Kiev deemed illegal.